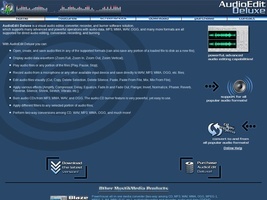 audioeditdeluxe offers all spectrum of track extraction, conversion, recording, editing and burning functions. It supports a wide range of formats. Users can open, create and save audio files, record audio from microphone or other input devices, apply several filters and numerous effects too.